Ellen Grae is a teller of tall tales. Most people know better than to believe any of her stories, even if some of them do have a grain of truth in them somewhere. Strangely, though, of all the people in town he could talk to, the reclusive and mentally disabled Ira has chosen Ellen Grae as his confidante. When he tells her the truth of what really happened to his deceased parents, Ellen Grae is sure he isn't exaggerating at all, but she wonders whether she must reveal his secret or keep it to herself in order to feel at peace. This slim novel presents a moral dilemma much like the ones encountered by the main characters in Wolf Hollow by Lauren Wolk and On My Honor by Marion Dane Bauer. Essentially, the story is about the nature of truth and whether it is ever okay to bend, stretch, or altogether avoid the truth, either to save someone from trouble or to protect yourself from the consequences of causing trouble. In posing these questions, the book asks young readers to both evaluate Ellen Grae's actions and to consider how they might act in her place. In addition to raising a topic for discussion, this book is also just really different. Ellen Grae is an intriguing character, as is Ira, and the dialogue throughout the book feels fresh and real, as though real people are speaking to one another and the reader just happens to be listening in. Like these authors' Where the Lilies Bloom, this book also has a strong sense of place. 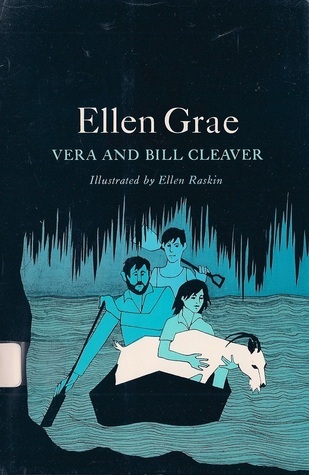 I could clearly picture the river on which Ellen Grae travels with Ira and her friend Grover, as well as the swamp where Ira reveals the truth of his parents' fate. The vividness of the swamp, in particular, is important because it figures heavily into Ellen Grae's thoughts about Ira's parents once she learns what happened to them. Also interesting are Ellen Raskin's illustrations for the book. I'm not quite sure that I like them, or that they are fully necessary to the story, but they do have a haunting quality that suits the mood of the story. They give effective visual impressions of the characters' internal struggles. The cover illustration is the best of all the pictures Raskin provides for this book and a perfect representation of what the story is about. Though this is a short novel, it is a challenging one and could be upsetting to elementary level readers, given the fact that there is death involved and a lack of a firm resolution that might be uncomfortable for sensitive kids. For middle school level readers, however, there is a lot of meat to this story, and I think most twelve and thirteen-year-old kids would have a definite opinion of Ellen Grae's actions, and Ira's as well, making the book fodder for interesting classroom or book club discussions.